A couple of years ago, I started a semi-regular feature on the blog wherein I review old D20 products, with an eye toward "What information in this book can be used in different RPGs?" That's a big theme of my blog - that you can find inspiration anywhere, and a lot of D20 material had some really great background and ideas that are usable whether or not you choose to use the mechanics of D20, which I know a lot of old-school gamers don't tend to like much. Today's book is Nyambe, sub-titled "African Adventures." This hardback book was published in 2002 using the D20 System License Document for the 3rd Edition of Dungeons & Dragons, but I first stumbled across it as part of a website created by the book's author, wherein he freely published a bunch of his ideas that eventually made their way into the Nyambe campaign setting. The ideas on the website were intriguing and showed a creative use of D&D rules, such as allowing Nyambe Paladins to have a lion companion instead of a typical horse mount. (As an aside, that minor tweak never made it into the final published book; paladins as a class are not part of Nyambe). The D&D game is very clearly based on standard Medieval European tropes, and the list of sources that inspired the original game creators seldom strays far from that type of fantasy - Conan, Fafhrd & Grey Mouser, Tolkien, etc. The first campaign settings developed for the game were also very European in flavor, including Greyhawk, the Moldvay Basic/Expert "Known World," and on through the mid-80's with settings like Dragonlance. Aside from a few scant articles in Dragon magazine, and role-playing games by lesser-known publishers such as 1979's Bushido, it wasn't until the publication of 1985's Oriental Adventures rule book for 1st Edition D&D and its inclusion of a fantasy Asian setting called Kara-Tur, that most role-players were exposed to non-European fantasy. That book opened my eyes up to a wider world of gaming ideas, and I began to design class variants and weapons for other cultures, particularly the ancient world such as Egypt and Greece. However, even at that time, two main sources always struck me as being very under-developed for fantasy role-playing: ancient India, and Africa. Throughout the years, Dragon magazine published a few articles about adventuring in fantasy Africa, most notably issue #189 from 1993, which included information on how to add fantasy Africa to your campaign setting, with details on the various peoples, animal life, plant life, monsters, warfare, slavery, and character classes; and another article on the arms and armor of various African nations and cultures. However, aside from that, very little other information was available. TSR, D&D's parent company, published a book called Al-Qadim: Arabian Adventures, and also incorporated the setting of Kara-Tur into the Forgotten Realms, which gave it more exposure. They also published campaign settings inspired by the Mongol Hordes and on the Aztec and Incan Empires of the Americas, but Africa continued to be relatively forgotten. Flash forward to 2001, shortly after 3rd Edition D&D was published, and I'm sitting in my office at work reading a variety of different message boards about 3rd Edition to get new ideas for my homebrew game, the World of Samoth, when I stumble across Nyambe.com (long-since shut-down) and a bunch of fantasy Africa ideas which were perfect for my world's continent of Atkira. I began printing out pages during my lunchbreaks and after-hours (I didn't have internet access at home during this time) to read at home, that I eventually had bound into a small book which I actually still have to this day. Shortly after having discovered the site, I read that Atlas Games was going to be publishing Nyambe as a campaign setting in a big hardback book, and I couldn't wait to add it to my collection so I could mine it for ideas for my campaign. Nyambe: What Do you Get? There is also a bibliography, a very detailed index, and the obligatory Open Game License. The book is a true mix of both game mechanics for 3rd Edition along with lots of flavor text that details the world of Nyambe (properly referred to as Nyambe-Tanda, which translates to "Land of the Overpower"). However, as I continue to maintain throughout my game-related reviews, even if you are not playing a 3rd Edition or similar game system, there is still plenty to be mined from that information if you want to include fantasy African elements in a game with whatever system you choose. For example, reading the background for the Prestige Class known as the Magic Eaters and why they exist in these lands, along with descriptions of their class powers, is great information that can be incorporated into a game even if you don't use the mechanics. Similar techniques can be used by reading through the skills and feats; feat names such as "Arboreal," "Create Gris-Gris," "Drum Dancer," "Elephant Warrior," or "Ritual Cannibalism," provide tons of inspiration for the type of world in which the characters live even if you choose not to use the mechanics as presented. For those who are not very knowledgeable about the history of Africa and its various cultures and nations, the presentation on the various races and cultures, as well as the Lands, Nations and Societies, will be invaluable in portraying a fantasy Africa setting that is more than just "Europe with different clothing and weapons." The standard D&D races are not represented here; instead, there are different societies of humans, each with its own description of personalities, physical descriptions, relations to other races, alignment, lands, religion, arts, food, language, sample names, and examples of adventurers, classes, and feats that are appropriate for that race. There are 12 different human races presented, but the game mechanics are the same for all of them; this is all just "flavor" to identify different types of cultures from an entire continent of inspiration. For example, there are the NaBula, who hail from the northeast and are reminiscent of real world northern Africans close to the Middle East, and the Nghoi, a race of darker-skinned Nyambans, most of whom stand less than 4 feet tall. In addition to the 12 human cultures, a variety of different non-human races are presented, including Agogwe (small non-humans similar to halflings, but who are fierce warriors who crave hand-to-hand combat), Kitunusi (similar to gnomes with a connection to shadows and darkness), Ngoloko (remnants of the once-mighty orc nation of Kosa), the dragon-blooded Unthlatu, Utuchekulu (dwarf-like creatures forced above ground by powerful volcanic eruption), and the Wakyambi (an elf-like race that dwells in the trees and who were once the favored slaves of the Kosan orcs). The section on Equipment includes not only new weapons and equipment, but also adventuring gear such as papyrus, ostrich egg and calabash bottles, game boards, natural medicine kits, and details on Nyamban instruments. The section also covers food, drink, and lodging, clothing, mounts, and also specialty items such as sunscreen. There is also a nice 2-page section on poison, the use of which is common in Nyambe-Tanda as it is not seen as evil. 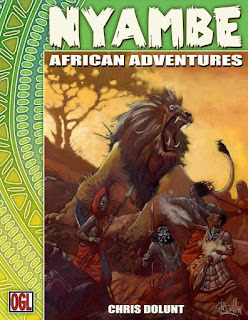 The section on Adventures in Nyambe covers a lot of interesting details for bringing the world to life, including advanced disease rules, various secrets from Nyambe (including details and adventure hooks for each major nation/society), and Nyamban treasure (art, coins, mundane items, etc.). The Monsters section includes not only new monsters, but also details on using appropriate monsters from the 3rd Edition Monster Manual. This book is a great addition to the slowly growing category of non-European RPG campaign settings. While it was published using the original 3rd Edition rules, the vast majority of this book can be dropped into a fantasy RPG of any system, easily stripping the flavor text away from the mechanics to create, or supplement, a fantasy African area to your campaign world. As a fun aside, Atlas Games' Northern Crown setting, which I reviewed here, uses Nyambe as the Africa analogue of that world. Format. 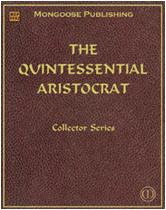 Originally published as a 256 hardback book, with 16 color pages (including maps) and the rest in black-and-white. Where to Buy. Although long out-of-print, print copies are still available via online shopping sites such as Amazon and Paizo Publishing, for as little as $10.00 for a hardback book. Paizo also sells a PDF version for $19.20. More Information. The "official" Nyambe site is housed on Atlas Games, where you can read about author Chris Dolunt's inspirations and motivations for creating Nyambe, as well as get links to purchase a PDF of the book or the two companion books, Nyambe: Ancestral Vault (a book of Nyamban magic items) and Nyambe: Dire Spirits (an adventure).